After being drawn to the first volume of Joey Weister’s Mermin from Oni Press, I was already excited bout the next two books. As it happened, I was able to score Mermin Book 2: The Big Catch and Mermin Book 3: Deep Dive from the library and tore through them. To give a bit of a recap, the first volume found Mermin, prince of the underwater city of Mer heading to the surface where he started palling around with some kids. 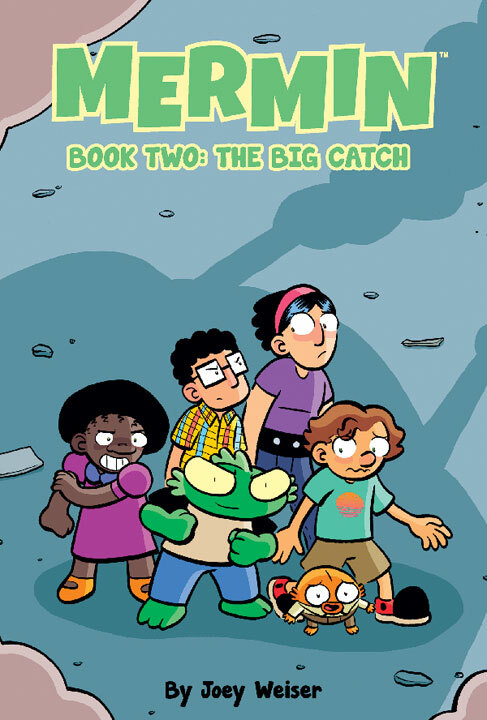 The Big Catch picks up immediately afterwards with Mermin’s underwater pal Benni and fellow grade schooler Penny joining up with Mermin’s group of friends. While they deal with bullies and other usual school stuff, there’s also a pair of self appointed paranormal investigators trying to prove that our boy is an alien. This all comes together at the end as Mermin faces off against one of the agents in a homemade mech suit before ending in a cliffhanger revealing that he needs to return home! Which, of course, leads right into the third book which finds Mermin bringing his pals underwater to Mer where tensions with neighboring Atlantis are taut as a fishing line. While there, the kids learn more and more about Mermin, his family and the deal with his brother. Without giving too much away, this one ends on an even bigger cliffhanger that takes Mermin’s friend Pete away to Atlantis! 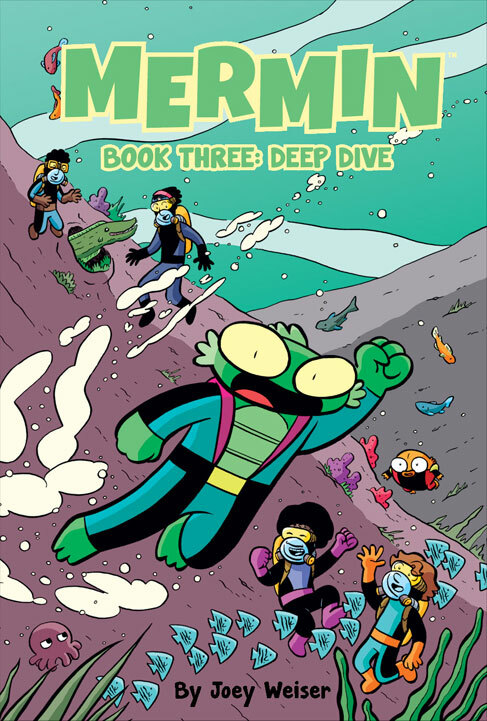 Even without such an Empire Strikes Back-esque ending, I’d be hooked on this series because I love the kids — from Pete’s nervousness to Penny’s amazing courage — and am fully intrigued when it comes to the hows and whys of Mermin’s self-imposed exile on the surface. 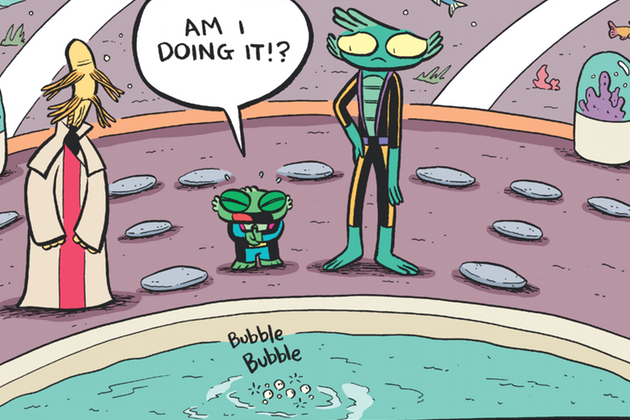 Weiser’s cartooning and storytelling chops continue to impress and stay incredibly consistent throughout all three books lending a continuity between all three volumes that makes it feel like one whole thing. The third book also allows Weiser to expand the visual look of the book which sounds like it will continue into the next, which hits in September. In the red flag department, these next two volumes are pretty consistent with the first. There’s a bully kid named Randy who is a total jerk, the talked-about death of a particular character (who I think will pop up eventually) and more fisticuffs, but not anything more than you might see on an average Cartoon Network adventure series. Speaking of which, I’d love to see a Mermin cartoon if anyone’s paying attention. There’s a mountain of goodness to be mined here for a multi-season series.